Happy World Cardmaking Day! We are having an Operation Write Home Stars and Stamps Blog Hop in honor of this day. Lots of cardmakers are participating, so make sure you check out all of the talent. If you’d like to know more about the current needs of OWH, check out Operation Tape Gun. Welcome to my stop. My card is very simple and features a little bit of dimension and some texture. The stamp came as a bonus on the cover of Craft Stamper magazine! Each issue comes with an acrylic stamp. I colored the “Rose Square” stamped image with Copic markers. The small purple piece is popped up with dimensional adhesive and the sentiment die cut floats above the background. I am helping others make this same card at Runaway Art and Craft Studio this weekend during a Make & Take on Saturday. To return to the Hop, go to the top of Operation Write Home Stars and Stamps home page and you’ll find it at the top of the page through this weekend. 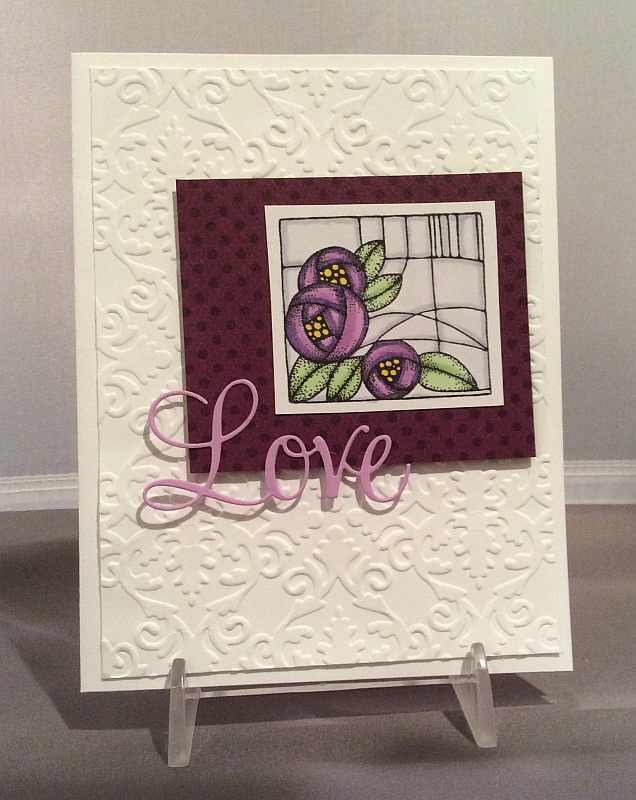 This entry was posted on Saturday, October 4th, 2014 at 12:00 am	and tagged with bloghop, cardmaking, die cuts, embossing, flora, penny black, stamping and posted in Love, OWH. You can follow any responses to this entry through the RSS 2.0 feed. This is so striking! The deep colors, embossing, and die cut all work together to create a really rich-looking card. Love your embossed background, and the coloring on your focal image. Great color scheme, too. Tfs! I like your coloring, embossing, and the Love word. TFS! Stunning!! Great job coloring and I love the embossing! I like the colors you used! I just got the stencil for the background and loved seeing it in use! Thank you for supporting OWH!!! Yummy card…lovely coloring and the extra dimension you added to this. Thanks for sharing!